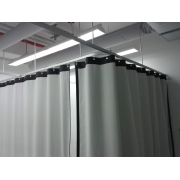 Laser protection and safety curtains are ideal for separating non-permanently spaces which house lasers, different parts of a laboratory or for example to isolate an optical table or a laser production station. 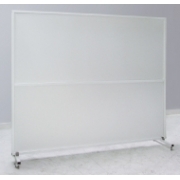 Depending on the power of the laser and the budget, we offer economic laser protection curtains for low-power lasers, or laser protection curtains for high-power lasers. We also offer rigid laser protection and safety screens, light and easy to install thanks to the wheels with fixing that they have. If you prefer a custom laser protction barrier with certified laser protection materials, we can offer the Prometheus material from which we manufacture some of our laser protection and safety cabins. All our materials are certified EN12254. If you work with lasers, remember our laser power and energy measurement section.